We were very impressed by the Kawasaki KLX250 when we rode it at the press launch a few months ago. In particular, we thought the bike was well-sorted, from an engine performance, comfort and suspension perspective. Although the only real change for 2018 from the 2009 model we previously tested is the addition of fuel injection, this change seemed to benefit the machine by providing improved engine performance (including responsiveness and fuel economy). 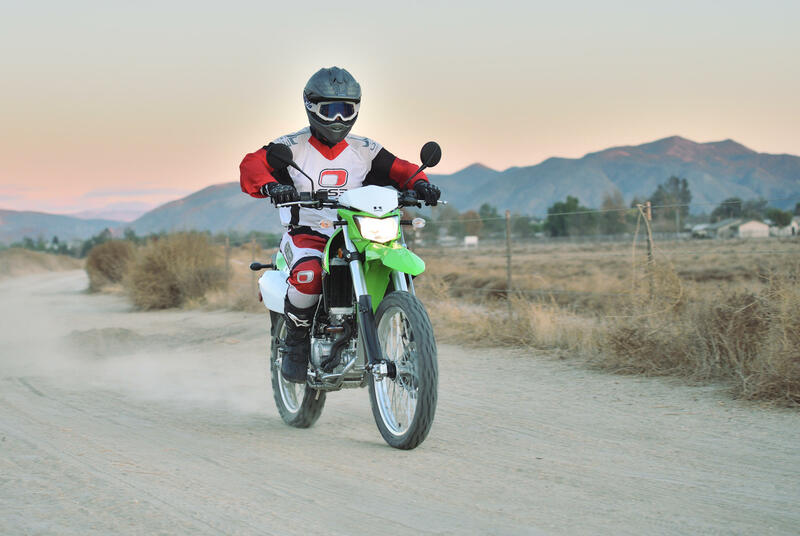 We asked Kawasaki for a test unit after the press launch, and put miles on the bike, both on road and off, near our offices in Temecula, California. Here is our report. Our general impression from the launch remains. This bike feels bulletproof, which is important for a single-cylinder 250cc, street legal machine. In other words, you will spend a lot of time with the throttle pulled to the stops and the rev counter near redline (10,500 rpm). Throttle response is smooth, and the new fuel injection system is well tuned, providing a broad, linear powerband. We found the KLX250 relatively smooth. A 250cc single is, in general, barely fast enough for commuting on the highway (here in Southern California, the flow of traffic can be near 80 mph), and the KLX250 is no different. Although the bike will do an indicated 80 miles per hour, it is much happier at 60 mph, or so. Nevertheless, if your commute does not include long stretches of highway, the KLX250 could be an excellent choice in a dual sport. Averaging roughly 65 mpg, we didn’t feel particularly limited by the 2.0 gallon fuel tank. The light (Kawasaki claims a wet weight of 304 pounds), nimble nature of the KLX250 is a huge plus when you want to grab a bike in the garage and go for a ride. 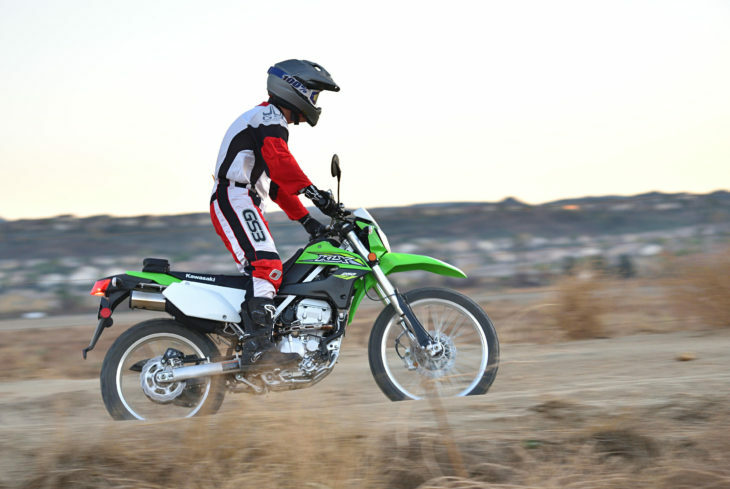 Despite the light weight, the KLX250 proved stable flat-out at 80 mph. The bolt upright, dirt bike-like ergonomics are extremely comfortable, and allow the rider to easily survey traffic conditions on the road. Designing a seat for a dual sport is a challenge, particularly when you want the bike to be a capable off-roader, while still being reasonably comfortable on the street. 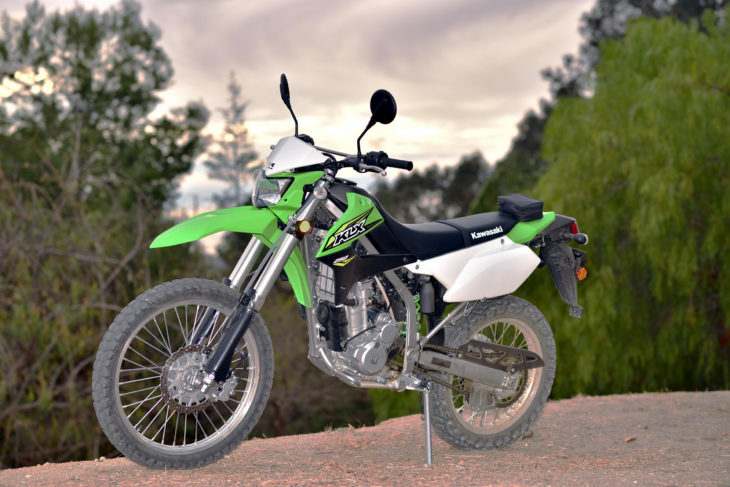 Here, we think Kawasaki found an excellent compromise, as the seat is flat and narrow enough to move fore and aft off road, but still reasonably comfortable on the street. If a rider is purely focused on the street, however, an aftermarket, wider seat might be a wise choice. The long travel suspension works well in the dirt, yet remains plush and reasonably controlled on the street. The knobby tires, of course, are not the best for carving tarmac, but they do add to the off-road capability of the KLX250. The brakes, including the single disc in front, work surprisingly well — in part, no doubt, due to the extremely light weight of the bike. The six-speed transmission shifts easily, and positively, together with a relatively light clutch pull. If you are looking for a light, comfortable dual sport with genuine off-road chops, the KLX250 deserves a very close look. With a U.S. MSRP of $5,349, we think it presents good value, as well. For additional details and specifications, take a look at Kawasaki’s web site. I’ve ridden my friend’s KLX250, and with my 200 lbs. on board it’s scary slow on the street. I nearly got run over from behind by a Prius going up a hill. If you keep your street riding to little two-lane country roads, then it’s probably a fine little bike. They hop up well and easy. My ‘97 KLX300R with a cam and carb upgrade could keep up with 600 supersports on the streets. I think the 300s were a bit lighter too at just over 250 wet. Hmmmm…. keep up with 600 supersport on a modified KLX300 can ya? Must have been some pretty poor riders on the 600 or a super twisty road/cow path. The dual sport mission statement is a tough one. I used to have a DRZ400, great bike, with plenty of size and power to get to the dirt but rather heavy to deal with off road. Tire compromise between road and dirt is a problem as well. Yamaha WR250X would be my choice, expensive but the quality and performance are there. I have a new Honda 250 Rally with I’m sure similar engine performance, I love the bike, except the power, mine runs good down low and fair up top, my particular example feels lean in the midrange, maybe that’s where they measure emissions, not sure. So now, I’m looking at a fuel controller to richen it in the mid range but then I’ll still be limited in HP, I really want to enjoy the bike but as it stands, it’s just too slow, and I’m not a power hungry rider, if we could just get another 100cc with properly tuned efi, lots of folks could find these bikes more attractive, just my .02.. It is probably set lean for emissions, plus it weighs a lot, 50 pounds more than my XT250. That is a big difference on a small bike. In case y’all haven’t noticed, the new motorcycle business in America is in the toilet. Probably had to fuel inject a model Kawasaki already builds to meet Euro regs and call it new. The new Wing is an example of Honda trying to draw in a broader spectrum of riders. The old riders can keep their old ones, and if you want the same old thing, there are plenty mildly used. We have a local KTM dealer that has 5, 2017 690 Enduro R’s and asking $9300. Don’t hold your breath waiting for the Japanese companies to build something like this. Had a DR350SE. Couldn’t image having a bike that was slower than that so 250’s are not in my future. Soccer moms in minivans would pass me up like I was going backwards. My next Dualsport will be a Dr650SE with enough umph to give cagers a run for the money. I am looking fwd to my next one as I live away from the city and freeways where speeds are lower and dirt roads are everywhere. Nice for a 250, but can someone please make an updated fuel-injected 650 single with 50-55hp, ABS, decent ergos and comfy seat, rack and luggage options, 5-gallon tank, moderately-sized windscreen, and 32-inch seat height, at $7500-$8000? I’m with you Tom R.
Not new, but this is what is local for me. +1, the BMW F650 met a lot of those criteria, but was fairly heavy offroad. The seat height isn’t as important to me, but the rest is. As long as your dreaming why not have it weigh 275 lbs ready to ride. The Husky Terra is exactly what you want. Exactly, but not a KTM…..I’ve had a few and personally want something less maintenance intensive. Here is a link to what 250cc dual-sports are really all about. Sometimes guys just like to buy play bikes that aren’t all that serious. This is one of those, as is the Honda CRF250L. Isn’t the new Dakar 250 a more serious contender? I think if a guy was going to go serious in the dirt, he would probably buy one of the KTMs or Husky’s meant for serious dirt work. No matter what the Japanese would never be as competitve as the Euros, primarily because the Japanese build for the masses rather than the few. That’s some snobbery if I’ve ever heard it. Maintain a Japanese bike (which specs out typically as well as a Euro) and it will last as long if not longer. Ever buy a German car? Ever pay for repairing all the stuff that goes wrong at 60K? Better yet, visit Japan and see the fanatical attention to detail (Takata airbags not withstanding) that goes into both hand-built and mass produced products. Snobbery? Mickey was simply referring to the fact that the KTM and Husky dual sports are basically (very capable) dirt bikes with lights. More capable off-road, stone stock than the Japanese offerings. He made no reference to reliablility. if you think that’s snobbery I think you misread my post. 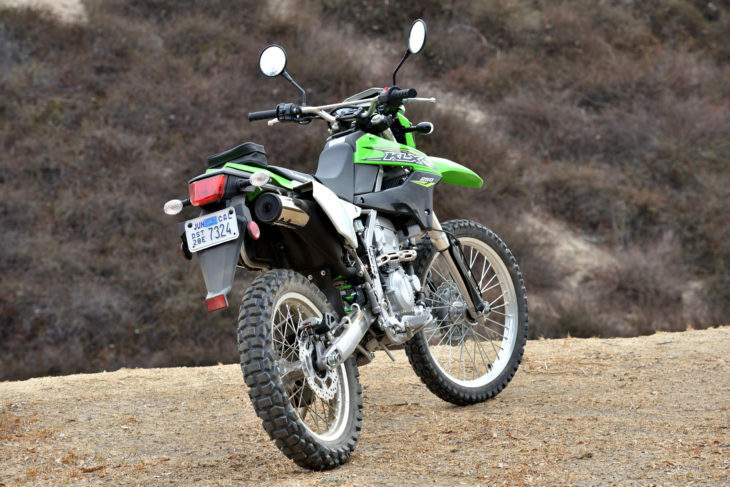 Hope they bring back the supermoto too (KLX250SF). I had one a few years ago and it made an excellent commuter. Granted I spent very little time on the freeway, but it would do it. I suppose if you’re willing to pay 5000 for a 250 dual sport some day you’ll pay 10,000 for a trail bike. Or 6000 for a 300 sport bike would get you to buy a 15,000 dollar super sport bike. You can even buy an entry level cruiser, drum brake and all someday leading you to by a top of the line tourer. But why don’t they build a bike which doesn’t make you think you could have done better? I was thinking for this class of bike a bike like Yamaha’s 250(XT?). It is what your paying for. I think the questions asked about Kawasaki’s 900 retro bike. No one wanted to know how good it would be on track day. Most asked if would be comfortable on a long trip. Maybe a good electronics package designed to help beginning riders thru their first few months would be a better selling point than it’s a decent bike but there’s better. Well, I bought a Yamaha XT250. I am not a beginner. I have been riding since 1983. I have owned many bikes including a Valkyrie and my current VFR. Still, I love my newest acquisition.. the XT250. Its isn’t just about the money, it is about the return on the dollar, even if I had paid 5k for it I would still be happier than a pig in shite. These bikes are all about a slower and more relaxed pace, taking every back road and trail you can find and knowing the bike won’t let you down. The 250cc class dual sports are a pleasure to own and ride. That is why they keep selling. Mine is a keeper. The “stepladder” scheme only really exists in the US and it’s a pattern we’d do well to break. In most of the world, this bike will sell to someone with no interest in “progressing” or going bigger. It’s perfect for those markets just like it is. By “stepladder”, Kagato was referring to the seat height. I just bought a 2018 and am still in the break in period. I can tell that this one will be a blast to ride once broken in. I’ll probably add an aftermarket exhaust and bump it up to 300CC. I only weigh 155#, so it has plenty enough power for me. My main reason for getting a 250CC instead of the something larger is that I want it to ride on the front hitch carrier of my Tacoma when I tow our Airstream. I also don’t like heavy bikes landing on me when I crash in the dirt. I’m not interesting in picking up a 450# bike. I would like to see who sells more dual purpose motorcycles the Japanese or European. The European models are race bikes with lights, horn and blinkers , 90 % dirt – 10 % road. They are expensive, maintance intensive with high costs and terrible on the road . The Japanese machines are 50% dirt – 50% road. They can’t be raced and need to be trail ridden at a slower pace than the European models. However they are significantly less expensive, required less cost and time to maintain and are more comfortable to ride on the road. There is a need for both but if the Japanese sell more dual purpose bikes than the European’s than perhaps the European’s are selling high priced turds. The KTM dukes are pretty reliable, but the design has become more street oriented over the years. I’m not talking about reliability its scheduled maintenance that is often and expensive. Also maybe you haven’t noticed that Duke model is not dual purpose . With the name MotoMaster you should have known. I could use a new duke on fire roads like a dual purpose, because I’m a baddass off-road, hence the handle MotoMaster.. You might have to keep it on asphalt all the time, but that’s not my problem. If your riding on fire roads there is no way you are a badass. Maybe you meant candyass. Come on if your riding on fire roads your definitely not a badass. And no I ride on trails on a real trail bike. You sold me. It would be a FE501 Husky for me. I would rather not have a 450. I have plenty of time on the 400’s and 250’s offroad. The 450 is too much in tight woods. They say the larger engines have more rotating mass that makes them more difficult to move around. My experience confirms the 400’s are more difficult, I will leave the reason why to speculation. I think that rider size plays a part. If you have a taller body, you gain leverage on the bike. A smaller rider has less effect on making the bike go where you want. The 450’s are too big for me, I already proved that. However, I do see a recurring theme, a 250 is too small for many people. Whether it be for high speed road sections or sand dunes. What they really need is 2 bikes, the 250 and a 350. Or compromise and bring back the 300. I think all of the 250 dual sports are brilliant and a ton of fun to ride. I just picked up a 2015 Yamaha XT250, the main reason is that it is air-cooled and proven tough and reliable. I first fell in love with them back in the early eighties. It has only 450 miles on it and I got it for $2900usd. Can’t beat that. Can anyone tell me why manufacturers are putting emphasis on 250 dual sports? They make no sense at all to me. They’re too tall for beginners and too slow for anything other than putting around the countryside. They’re flat out dangerous on California highways because they can barely get out of their own way over 60 mph. All the manufacturers make rockin’ 450 motocrossers, and yet none of them can go to the trouble to make one street legal? (I’m excepting KTM here, as their EXC model is 99% dirt bike and not really dual sport). Probably because of tiered licences in other countries around the world. A 450 dually would be for USA only, or more experienced riders overseas.. I guess the OEMS don’t think a large CC dually would sell well outside the US. Anything small bore is gonna have to be relatively high strung to make any power. I think around 500cc is about the point where you can detune a bike for reliability. Cb500 engine in a xr650 chassis, or a ninja 400 engine in a new dually could be interesting though. Overall though, I think pricepoint/value discussion holds manufacturers back in the dual sport segment more than anything. Must be where you live Jeremy. You could go years without seeing a dual sport where I live. Have never seen a KTM or Husky dual sport, ever. No place to ride them off road unless you own a lot of property or want to trailer one out to eastern Ohio or down to middle Kentucky where there are some state and national forests. I lied. Maybe 5 years ago I was in south eastern Ohio and riding past the forest out there on a nice curvy road and there must have been some kind of enduro going on because a lot of dual sport type bikes full of mud were coming towards me down the road. When I got to the next little town, the fire dept was squirting them off for free using a fire hose, which I thought was nice if them, but wondered about that high pressure stream on the electrics. Lots of KTMs. Haven’t seen one since. The Rocky Mountain states are admittedly an ideal area for dual sports. Even when I lived in Houston, though, I saw quite a few dual sports, both Japanese and European. I live in California, not particularly close to any legal trails or even dirt roads, just a few offroad parks which mostly see trucked or trailered bikes. However, over the past 5 years or so the number of KTM and Husky dual sports has really grown relative to DR650’s and KLR650’s to the point where I see several a week on the road. A 250 is a fine town bike here, but few people will ride a 250 100-200 miles to go off pavement. It may be a niche market, but a fuel-injected Japanese 650 with quality suspension and some attention to weight would inject some excitement into the market, and probably provide good ROI for the manufacturer; just sell them for 20-30 years like the DR and KLR. I ride a DR650 and would love an update that is 80% of a Husky 701 at 60% of the price. Short answer: America is not the world. 3. Terrain. Where I live (SE Asia) dirt bike trails are really tight and trecherous, nothing like the fire access roads in SoCal. Most “serious” dirt riders opt for air cooled 150 bikes. In fact Honda just launched an aircooled CRF 150. But yeah, I understand your sentiment. 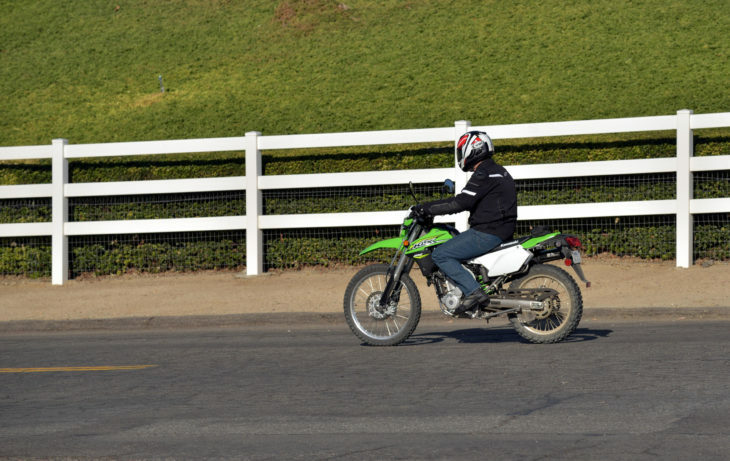 I lived in LA for 8 years, I will not ride a 250 on the higways. There is a market for bikes like this one that the serious dirt riders don’t understand. My wife and I had a Kawi 250 and a Yami 250, and we used them to explore Florida & Georgia both on the back roads and the numerous dirt trails that criss-cross the states. Great fun, and blasting down a narrow dirt trail at 60 can actually be exciting. It’s lighter than the CRF250L by what 20 pounds? I’ve ridden the KLX250 and it feels fairly light. I’ve only picked a CRF250L up off the stand and it feels heavy. I think it’s a well-designed and balanced bike for both beginners and experienced riders. I do wish you could opt for a larger tank from the manufacturers. But the all-important question is: is it better than a CRF250L? All of the comparison tests I’ve read about 250 duallies have said that the Honda is the slowest and least desirable one of the three in stock trim. Have you seen a comparison after the 2017 engine tweaks on the crf? It got a small bump in power and torque. I wonder if it was enough to make a difference in a shootout. The Ride expiditions guys are right, the Honda is probably more reliable and better to keep for a long time. Although Aluminum frames can crack, then you’re S.O.L as far as a cheap fix. But overall, the quality of all the small bolts and fasteners and whatnot is hard to beat on a Honda or Yami. I guess the new Honda has more power, because all of the older tests I’ve read said the Kawi and Yamaha had a pretty clear advantage over the Honda. I have had three Honda singles that have let me down, sometimes catastrophically. I have also owned a number of Yamaha enduros and trail bikes with no problems – ever. I did have a KLX300 that I sold off before it’s kick start gear had the chance to explode the engine case. That was a thing. Dman, not saying there was never a Honda 4 stroke single without an issue, but Hondas reputation for reliability was built on the backs of their 4 stroke singles. There is no denying that. Well, when you only buy used motorcycles, you never know what you are going to get. I’ve never worked in the industry but I have been riding dirt bikes for 50 years and yours is the extremely rare exception to the rule. Honda air cooled 4 strokes of every displacement have been absolutely stone axe reliable since they first began importing them to the US in the 60’s. I’ve owned five 4stroke singles, three of them Hondas (XR200R, XL600R, and FT500 Ascot) plus about ten other bikes and the only mechanical failure I’ve had on any motorcycle, including two Bultaco and a Ducati, was a broken camchain on the XR200, with resulting bent valves etc. plus, a friend had severe cam wear on his XL350. So, yeah, I’m not sure I can unreservedly vouch for Honda singles. That’s been my experience with Honda singles, both mine and others, when we rode them many years ago. Most weren’t stressed very highly compared to some brands and just kept on running even when maintenance wasn’t really a thing. Mind you, back in the day the two-strokes tended to drop like flies with fouled plugs, holed pistons or even broken rings, etc. Simple to work on but you were in there much more often.